Brilliant! Thank you for saying it, and for saying it so well. More power to your arm, sir! Amen to that. Anyway most not if all so called Christian Values are also shared by most Muslims. What a brilliant put down Irfan, God bless you! After migrating here Tony Abbott refused to join the majority group in team Australia, he insisted on remaining among the minority papists: and hob-nobbed with an Italian migrant to boot! I love it! Your reminiscences of your school days brought back memories of my own in a state school, being punched in the stomach, made to kneel in the playground and recite Hail Marys - ah, those were the days. No doubt you will already have noticed that the Australian flag so thoughtfully placed at the top of your article can also be used to decorate stubby holders, as a material for bikinis and board shorts and has even been spotted tattooed on the buttocks of some patriotic Australians? Patriotic I say because we dinkum Aussies insist that if you don't like our flag, then leave. No, Irfan, there isn't anything Christian about demanding newcomers to our shores jettison their own values and become that ridiculous caricature a 'real Aussie' and thank you for bringing it to our attention. TEAM AUSTRALIA – YOU ARE WITH US OR AGAINST US “Team Australia" The Australian Conservative Prime Minister Mr Abbott citing the need to engage Australia's Muslim community on new anti-terror laws, Mr Abbott declared everyone needed to join "Team Australia" and support the Government's proposed new counterterrorism laws. This is not about some jingoistic slogan we banter at the local pub. Muslims around the world have long denounced terrorism around the world and especially when it afflicts the Muslims Ummah and other places where ever it occurs. The mainstream chose to ignore this voice. Calling on Muslims to be part of team Australia should not assume a blind acceptance of the government’s legislative narrative when genuine concerns are raised about their impacts. We have experienced this previously. Fanning the fears of hate and suspicion is designed to alienate and further marginalise minority communities, not nation building and inclusiveness. Former Conservative Prime Minister John Howard was a master at this wedge politics and fear mongering to polarise the community for a political end. We remember the politicisation of the deaths and lies in the Children Overboard with 146 children, 142 women and 65 men died, then used by Howard to Win the election. We remember then also Prime Minister John Howard talking about Iraq and the intelligence report, the argument that Saddam did have weapons of mass destruction and we have irrefutable proof”, that lead Australia to be a leading cheer leader for the invasion of Iraq in 2003. We remember also the politically motivated claims to incarcerate Dr Haneef on trumped up terrorist charges. So if we don't play on your Team Australia its because you are playing by un-Australian rules. Great article. Read section80.2, paragraph 5 of the Anti-Terrorism Act 2005 (No.2) and then read www.abc.net.au/mediawatch/transcripts/s1574155.htm and join my campaign to have Alan Jones charged with a breach of the anti terrorism law. Thank you, Irfan. I am pleased to stand alongside you. Bravo! We so need to hear this in these dark days! Well said, and thank you, on behalf of all decent Australians. Great comment Yusuf. There are values which transcend any national or cultural boundaries and they go to the core of our understanding of who we are as human beings, and the way we should relate to each other. The beatitudes is one expression of these values. "What oft was thought, but ne'er so well-expressed" A splendid article which deserves the widest circulation. You raise a number of important points, Irfan and you are by no means a fool - the exact opposite I would say. I have read your autobiography and think it provides information the average person might find extremely useful in attempting to understand our Muslim fellow citizens. Like you, I arrived on these shores (in 1956) as a lad from South Asia but my family background was rather old fashionedly " Anglo-Indian" in the Kipling sense as our family had gone out with the East India Company in "those" days. Having expected my father to "stay on" like many of the old Raj hands till retirement and expecting to go to my public school in England I was amazed when we decided to pull up stakes and come here. Australia in 1956 was something else! It has changed beyond recognition. It is, of course, much more multicultural, multireligious and multiethnic now and I think that, on the whole, is a thoroughly good thing. There is, I think, no turning back. One of the TV shows which has quite entranced me is the current SBS one "Australia's Secret Heroes" about Z Force. Many prominent members of it, like the legendary Jack Sue, were Asian-Australian. It is a heartening show and I think it represents the way of the future. A rational, concisely expressed comment on what is just so wrong about "Team Australia". I posted a link on Facebook. A simple thank you Irfan for highlighting the exlusive, ignorant and divisive rhetoric that reflects the paucity of leadership that many christians and muslims seek from our elected officials. I suspect Mr Abbott is too busy rallying the team to stop and reflect on the wisdom of your words. Thank you Irfan for sharing your own experience of school days in Australia. As I was reading your article I kept replacing the word "western" for "Christian", however this might not have been how you experienced it. Most religions have the same values, similar to the Christian 10 Commandments. So the bottom line needs to be respect for each other and acceptance of differences, no matter if it is different customs, different clothes, different food. And let's not forget the spiritual values of the indigenous inhabitants of our country. And I'll add my Catholic vote to you Yusuf. As others have said, all this needed saying loud and clear. So-called leaders who spout this non-Christian sloganeering need to be brought to account & the sooner the better. And all they manage to do is make the day of all the bigots, yobbos and ratbags found in every religious or political group across the country. [Tidied up] Reading Irfan Yusuf's article made my heart sing. The arrogance of abrogation in claiming exclusive possession of the values of being to the Christian faith is nonsense and dangerous folly. The behaviour of Australians, whether in schoolyard bullying or institutional denial off the principle of the acceptance of love, both denies any assertion of Team Australia and Team Jesus and vindicates the reason why the majority of Australians who are decent and caring people have concluded that the so-called guardians of Christian values (whatever they are) have discredited themselves by their actions. I write as the Dean Emeritus of an Australian Anglican Cathedral and still working, albeit part-time, as an Anglican priest who deeply laments what he sees in parts of the administration and operation of the institution to which he has given most of his life. Onya Irfan! Great article, thankyou for articulating what so many Australians really think and believe. I second Helens comment and will be forwarding the link to several people. Unfortunately, they are like minded already! Irfan , as an Australian Christian please accept my apology for the treatment you have received over the years. Bear with me as I try to eliminate any hint of racism ,sexism,ageism from my daily living. In spite of Our grim record in our treatment of our First Australians, our insensitivity and cruelty to asylum seekers , the mentally ill and disabled our suspicion of people and things different , some Christians are slowly trying to spread the word of the Beatitudes. Without clear unambiguous Christian leadership it is a slow struggle but with determination and hope we try to work on to a better Australia. Thank you for saying it as it is And was for you. Team Australia ...hearing that coercive spin really got up the nose of my Irish and Italian ancestories with their very different forms of Catholic. It reminds me of an earlier time in our history and the then Prime Minister Billy Hughes and the divisiness of conscription. I'm Australian....Im just not on your team Tony. Well Irfan Yusuf, you've recently moved from Sydney to Melbourne. Perhaps you will become aware of the barbs that are traded between those two capital cities. Moreso, by moving to Melbourne, you'll need to invest in AFL culture... it may not necessarily be Christian, but it's an integral part of Melbourne. Australia, you're standing in it. It's a multi-faceted society, as your observations support. Samuel Johnson once said "Patriotism is the last refuge of a scoundrel". The "Team Australia" proposition by Mr Abbott freshly reinforces that maxim. So insightful, thank you Irfan. You have broken rich new ground in tracing Abbott's own youth as a vulnerable immigrant and Catholic looking from the outside into a pretty narrow Australia at the time. If Abbott read your article, he might see its justice and wisdom. Of course there is a famous historical analogy - a socially dysfunctional excluded Austrian youth who desperately wanted to join Team Germany. We must cherish and defend our multiculturalism. There seem to be two sources of the divisive influences that cause so much strife among different groups. The first is a relic of the immature instinct of babies who feel comfortable only with those they bond to in their early days, and have not yet learned the advantages of expanding their relationships with other individuals and groups. The second is exaggerated regard for the Bible. The Bible is a motley collection of ideas, interpretations and traditions produced about one hundred thousand years after the advent of the first homo sapiens, by minds that did not have access to the data required for forming definitive decisions on fundamental matters. As such, it is like a gold-mine, containing some nuggets of valuable insights, mixed with much rubbish. It is full of contradictions. Among others it says that God not only condones genocide, but even commands it on occasion. Everyone can find verses to justify whatever they want to do. Peace and harmony would have a better chance if the Bible could be replaced with a more enlightened book. Who in their right decent mind would join a 'team' of cruel lying racist elitists out to disadvantage the poor, unemployed and sick, willing to destroy the environment for short term profits and renege on their UN obligations to grant asylum to refugees. It is an indictment on our current leadership that such a powerful and cogent rebuttal is necessary. Note to PM--read, think and learn! Note to Mr Yusuf--keep swinging, there are plenty of us with you! I can only agree and amplify earlier positive comments. A voice of reason around which we cab build some hope for a fair & just country. I am tired of reading the self-flagellation in these types of articles and the comments that praise them. Yes, Australia is not perfect. Some of the criticisms Ifran Yusuf raises are valid. Yet so many people who see racism in our own culture appear unable to see it in other cultures. Only a week or so ago, Muslims in the streets of Sydney were being told by one of their leaders how corrupt the Jews were. Wherever there was corruption, there were Jews. (How do you think they rate multiculturalism, Tony Kevin?) . But it's fine to take Tony Abbott and other "Christian Aussies" to task. It's as if we're the only ones capable of hate. Rather than mainstream Australia excluding some minorities, some minorities plainly state their rejection of us. Check out Hizb ut-Tahrir's website. See how enamoured they are of Australia and its liberal, democratic pluralism. They outright detest us and they are not shy in threatening violence to change the system to suit their specifications. Finally, people vote with their feet. If this country is as putrid as many here seem to say, why are so many people trying to get here? Thanks, Irfan, for your article, and for the response it has generated. The metaphor of team often has the ring of a collaboration among like minded people who will give their best for a good cause. I think that many people hold that sentiment when they speak positively about Team Australia. What happens in fact is that Team Australia, as it is portrayed by Mr Abbott, is not about collaboration but about efforts, directed autocratically without room for question or resistance. Mr Abbott has reserved for himself the right of "captain's call" within his cabinet on several occasions, and wants to insist on it for the whole country. This Team Australia thrives on opposition and competition, with the captain deciding who is the enemy, and who deserves to be in the Team. Though he now referring to cabinet ministers as George, Julie, and Joe his Team is not a collaboration. His voice is to be heard and obeyed. We have seen the damage that Team Vatican does to the people who have trusted the Catholic church, what Team Political Party does to the government in NSW and in other states. We need a better metaphor to call out the best in us, and to create a "society without borders"
Abbott and Catholicism. To be Catholic is not necessarily Christian and Tony Abbott is completely out of step in his understanding of what the word Catholic means which is universal. As an older Australian I apologise for the ignorance of those who have caused you to feel unwanted and marginalised in this country. If we could all walk in peace together oh, what a greater country Australia could become. Any hatred of the current government pales into insignificance when one looks honestly at what is happening in the Middle East. The silence is truly amazing. You're absolutely right, Irfan. However, one tiny query. Is it very likely Tony Abbott was bullied because he was a Catholic? By the time he came to Australia, Catholics weren't a despised minority at all, and the Catholic kids gave as good as they got. I don't think we can excuse our Teamleader on these grounds! "Minorities have been bludgeoned into joining 'Team Australia' by shedding what they could of their foreign dress, food and religion." So of course, you'll be able to supply copious solid references to migrants being "bludgeoned" into not eating their own food? Or is this just another one of those statements in which this article abounds which surely is not meant to be taken seriously - such as Australians driving "Christian cars on Christian roads"? Where does the irresponsible hyperbole end and serious proposition begin in this piece? What a brilliant essay!! I hope both the author and Eureka Street will explore having this published in major newspapers. This article needs to be read and quoted across the country - including in our schools and places of worship. Thank you ! 'Team Australia' is more than just another of Abbott's simplistic slogans; rather it is another example of his conviction that he knows what is right and that everyone else must fall in with that view or be ostracised. An earlier example was when he accused the ABC of being 'not on our side', as if the national broadcaster was supposed to be a sort of cheer squad for his government. It is also an example of how he confuses his government with 'the Nation'. This is more than just political chicanery; he really believes it and that he, as the Prime Minister of the Government, represents the Nation. (If anybody represents the nation, it is the Head of State, not the Head of Government). A shared love of country is no doubt a desirable end, but as Edmund Burke said 'To make us love our country, our country ought to be lovely.' These are words that Abbott should sleep on, because nothing that he has done has had the effect of making our country lovely, in fact everything that he and this government has done is having the contrary effect. Thank you for this well written and thought provoking article. It should make us all think more carefully before we speak or act. The very fact that the needy can obtain generous govt sanctioned welfare payments here (and not in their countries of origin) speaks for a culture based on helping those who need it. Though it could be done better, the very notion of a welfare state is unknown in any Islamic country. Notions of freedom of conscience, critique of wrongdoers (even if they are clerics) all stem from ideas that were prevalent in the rise of Christianity. A good account of it (by a non Christian) is Rodney Starks' 'How Christianity Led to Freedom, Capitalism, and the Success of the West'. No jingoism here, just a history of ideas - Irfan it is an interesting read. My contribution is very short.Out of 35 Comments, I just like to say thank you, to Kevin G Smith, John Ryan, Jane and H H. God bless Australia. I went to Ryde East Primary as well, during the last 60s and early 70s. I copped the same racial problems (mum is lebanese) but I suspect it was a sign of the times, not just the school, as we had lovely neighbours. Still, it was very painful, and schools are like that. This Pommie leftist and staunch atheist is reminded of the immortal words of C. J. Dennis: "I dips me lid!" Bravo, Irfan! How much high dudgeon is possible in one article? There are Islamic as well as Christian countries that don’t live up to the ‘love’ professed by their religion. How can we ignore the thousands of Christians presently being murdered and driven from their homes, churches and countries, on two continents, and closer to home suffering lesser but blatant discrimination far worse than anything picked up by Irfan’s sensitive radar. ‘New World’ has been a melting pot of ethnicities and cultures since European occupation. There has been bullying (often murderous) of minorities throughout. A few ideas emerged from the scars. My father’s generation held that people should leave their old feuds at home when they come to Australia. The Irish learnt it. More recently Croatians learnt it after secret paramilitary training camps were found. Irfan, there are Muslims here who encourage foreign wars, and there is the prospect of terrorism returning to Australia (via some of your 40% Australian-born Muslims). We know that these are a tiny minority, but it would be good for the Muslim majority to take some responsibility, and take this opportunity (whatever their aversion to Abbot’s destructive sloganeering) to demonstrate that they share the concerns of the non-Muslim community and are doing their best to address the problem. . Fantastic article thank you --It would be great if mainstream Australia would embrace it's real history. Team Australia isn't about belonging it is bigotry and division. I'm interested in your comment, Ron Cini, but it's unclear too me why you would expect/hope/ask/pray that God would 'bless Australia'. Can you elaborate please? Irfan Yusuf, thank you for the sense and dignity of your article. My stomach turns at the hypocrisy displayed so prominently by the "leaders" of Australia. Clearly you love what is best about Australia but at present those in charge are using blatant and simplistic catch phrases to manipulate, create unfounded fear and worry all in an attempt to have Australians think that they are the ones to protect us from harm. Just plain humbug! So hopeless, so depressing. The Prime Minister seeks to bring people together only to be scorned and maligned by those who seek to maintain division, based in this case on old wounds from childhood. Mr Yusuf, children can often be divisive and cruel. Most children could complain of incidents of bullying based on racism and sexism, and indeed other things that could be classed as isms - like weightism (too fat), smartism (against the slow or dislexic), attractivism (ugly ones), heightism (too short or too tall), sportism (hopeless at sport) and so on and so on. Bullying is never OK, but an adult puts such incidents in mature perspective and leaves the childhood grudges and bitterness behind, and the community can or should grow in maturity accordingly. So for example most Catholic kids these days could not care less whether someone is a Protestant and vice versa - they cannot understand the historical animosity. Sure there is a way to go in other areas but preaching division based on old childhood wounds just keeps them festering. Like you, Mr Yusuf, where 700,000 buddhist Australians will have to go, or whether us 400,000 buddhist Australians will have to leave behind their 300,000 Aussie-born children for teaming to a "Christian-Australia-Team"? With respect to Jesus as, among many wisemen thru human history, who had probably delivered some good teachings for some part of world population [by convincing alone? or also by forces, threat and trick? ], but absolutely no any thoughtful buddhist can voluntarily recognise any creator God, god, gods, goddess, par His Holiness Jesus himself. Will 700,000 peace-loving buddhists be allowed to team with other 23-millions on a Secular-Australia, without forcibly to wear religious label similar with 60% others who self-claimed as christians or with 10%-churches-goers? We are a very nation-loyal and patriotic community. Actions speak louder than words: please check out yourself @ abs.gov.au for % trends of [not 3% but usually 5-10% even some upto 20% higher nation-wide average]: -schools/universities graduate -citizenship -paying taxes -buying homes -investing/inventing for & in Australia -joining DFA/PS -opening businesses, etc [we are much lower in ONLY one category: inmates criminal figures] Accept few have been converted by 'arranged marriage', all Australians will surely be more advantaged if most Australian Buddhists allowed NOT to team with a Christian-Australia, can we?. We are here since 1840s, mainly because of communists' persecutions christian rulers' jealous & discrimination. Where a Team-Christian-Australia like is to go If we will be discriminated again right here, at this democratic, free Australia, as we like to hold non-God and no-gods belief, as specific encouraged by the Buddha. Peace loving Buddhists like to be self-responsible for hell-heaven for our this-and-next-lives. We take Buddha's advice/teaching selectively, not even relying on him personally. Is that real, legislatively, that in the Australia of Century 21, that not believing on a creator god will be a crime? Thank you for writing this. I found it very informative. I agree with you 100%. We must take hope in that so many in Australia agree with you and are ashamed and disgusted by such comments and behaviour. Ditto Ron Cini. It’s only the “usual suspects” who recognize the Prince Potemkin villages which comprise this entire article. But then the author also appears to be an apologist for the detestable Muslim Brotherhood (“Irrational fear of the Muslim Brotherhood, ES, 20 August 2013). The founder of the Muslim Brotherhood, Hassan al-Banna was a devout admirer of Adolf Hitler and the Nazis. But the majority of respondents to this article, for reasons that go deep into the human psyche, meet the Potemkin deception by a corresponding need to be deceived. Abbott's Team Australia, which he claims to belong to, apparently incorporates Bob Santamaria's endorsement of Franco, the mass murderer who used Moroccan conscripts to kill Spanish democrats,and Mussolini who gassed Ethiopian Christians on behalf of his Catholic Italy. Glass houses and stones oh ye who throw mud. Well said Irfan couldn't agree with you more :-)! Assalamoalaikum There is of course nothing inherently wrong with the general statement that, "Everyone has got to put this country, its interests, its values and its people first, and you don't migrate to this country unless you want to join our team" - Tony Abbott. The problem is perception and context. Firstly, there is a hint of the 'you're either with us or with the terrorists' ring about it, since 'Team Australia' in the context of the press conference where it was first mentioned, was a euphemism for support for the Abbott government's plans to tackle radicalisation and the radicalised. Secondly, this call for unity behind 'Team Australia' was deliberately announced in conjunction with the decision not to pursue amendments to section 18c of the Racial Discrimination Act. The subtext and intended target of the announcement was clear. A quid pro quo, where Muslims apparently grateful to the government for not legislating for the right of bigoted expression, would return the 'favour' by endorsing prima facie any upcoming 'anti terror' legislative agenda the government might propose. As such, I'm left with the choice of either - accepting the government issued pom-poms, being branded un-Australian or worse (I am a Muslim after all), or starting a new team. 'Team Australians Against Sloganeering' perhaps? Irfan. You should be thankful you are an Indian Muslim in Australia. If you lived in parts of India I have travelled to you'd be murdered if you were the wrong type of Muslim or face other ghastly atrocities. Like it or not you are living in a beautiful country where you can travel safely from state to state. During the Blitz I was evacuated to Wales. I had to learn Welsh. Adapt to a different culture and learn to fight 'bullies'. No Mum or Dad to protect me or my brothers. Back in London I was victimised as a "Taffy". ETA Australia in 1953 I was a bloody Pom. In Malaysia, protecting Malays from Chinese Communist terrorists and an invasion on the mainland from Sokearno, I put up with vilification from Malays as a "Colonial Imperialist". Your experiences of verbal bullying, whilst valid, don't give you an excuse to slam AUSTRALIAN Christians, nor Tony Abbot for being one. The difference is you won't be murdered for expressing them. My experiences taught me to show tolerance. Show respect for difference. Invaded almost daily by atrocities of radical Muslims in many parts of the world forgive us for feeling threatened. Very well put Irfan Yusuf. Abbott simply doesn't seem to understand that 'Australian values' shift and evolve. He has them stuck somewhere in the 1950s methinks. "Who in their right decent mind would join a 'team' of cruel lying racist elitists out to disadvantage the poor, unemployed and sick, willing to destroy the environment for short term profits and renege on their UN obligations to grant asylum to refugees." Agreed Dr Vacy. Wonderful and moving piece, Irfan. The team analogy suggests we belong by opposing others, we give up our minds for the team and never question the leadership; alllow no tolerance for weakness or difference. Abbott appeals to Irfan's school bullies the same unregenerated maintainers of the fear which keeps the mad fight- flight politics going. Australia is not a team it is a nation. Even if Bunnings and others spins the word to pretend equality and conformity. And Irfan a personal apology as Abbott's 1970 fotball coach; but we were not an A, or a B team we were the Cs. As a catholic christian, I wonder what these "Christian values" are - sometimes not particularly christian, I think. Thank you Irfan. My grandfather was born in Australia in 1882, a hundred and thirty two years ago. He lived and worked for many years in central Australia. He used to say that it would have not been possible to do so without the work of the Afghan cameleers. He thought of them as the best bushmen in the country. Have we forgotten that our wide brown land has welcomed folk from many lands for a very long time? Australians don’t wear “Christian” clothes, play “Christian” sport or eat “Christian” food let alone drive “Christian cars” on “Christian” roads. Far from bludgeoning migrants into not eating their own food, our country groans with international food choices and – nothing to do with minorities “fighting back” from a mythical bludgeoning - our supermarkets happily devote large parts of long aisles to international cuisine. Likewise there are clothes shops for almost any non-Western attire desired. School bullying is an unfortunate practice the world over – it’s ridiculous to draw any conclusions about Australia’s character in this regard. The most prominent “exclusion and marginalisation” in Australia’s history is the slaughter of innocent unborn at the rate of 80,000 to 100,000 a year – something utterly opposed by official Catholic teaching and many Christians (inter alia). The other typical example - White Australia Policy - was not a Christian initiative: it was brought in by the Trade Unions and the Labor Party to protect workers’ wages from cheap imported labour competition. The policy was dismantled by the Conservative parties, beginning with Menzies. Mr Yusuf’s unreferenced quotation from John Howard may or may not be accurate, but insofar as it be true (and it seems from the theme of Mr Yusuf's post that it applies to him, if no-one else) it is just as applicable to white Australians living in Asian countries, so not particularly racist. Tellingly Mr Yusuf neglects to quote much more glaring examples of intolerance from the Labor side of politics: ie, luminaries as Arthur Caldwell “Two Wongs don’t make a White” or Gough Whitlam “I’m not having hundreds of f*cking Vietnamese Balts coming into this country...” But was Caldwell voicing Catholic Church teaching? And was Gough a Christian? I’ll pass over the attempt to psychoanalytically interpret Mr Abbott’s penchant for boxing as a response to his living in England in the first two and a half years of his life. Needless to say, it doesn’t exactly bolster Mr Yusuf’s thesis, if it can be called that. Our Lady Help of Christians, pray for us. All of us. Thank goodness for HH and one or two other perceptive responders. 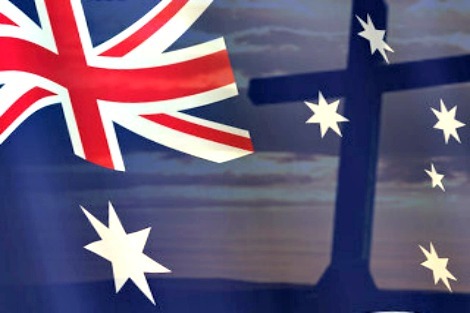 As a Christian, I have never been able to understand the statement that Australia is a Christian country. It makes no sense. I am very concerned about the right wing political ideology being peddled as somehow consistent with Christian values. What a load of twaddle. Thank you for the article. Thank you Ron Cini and Kevin Smith, John Ryan, Jane, HH, David, Philip, Damian, Ross, Karl, HH again and Reg. Your contributions have encouraged me to "hang in". Sounds great HH, but what on earth has what you've said to do with Tony Abbott's 'Team Australia'? I am intrigued by the logic used by Irfan Yusuf who claims to be a lawyer so much so that I will issue the following challenge. I will donate $1000 to any charity if anyone can demonstrate the truth of the statements that the clothes we wear are Christian, the food we eat is Christian, the language we speak is Christian, the clothes we wear are Christian and the cars we drive are Christian. There must be some logic to all this but I can't see it. Thank you Irfan for your great post, with which I find myself in complete agreement. Great read Irfan! Thank you. I must say I'm glad the anti-Asian stickers didn't work at the Blenheim Road shops, because I lived just around the corner a few years back and practically lived on the Chinese food from the little takeaway on Blenheim Road! Husband and wife who ran it were both wonderful people and he was a fantastic cook. Very nicely put! Australia is a land of extremes both geographically and demographically. We all need to learn tolerance and acceptance if we are to get along. It matters not what name we give God. What matters is what we do with the teachings given by the great prophets. We must not accept intolerance and fear as a creed to live by but sad to say this is being promoted as a tool by which to manipulate us. The best way of combatting this is of course to do the opposite and be more tolerant... May this phase in Australian politics pass quickly for I find it tiresome and I am lucky to be an Anglo white skinned individual by accident of birth and not subject to the discrimination many experience. Peace! As an Australian living in a foreign country, I can attest to the rather poor regard the current Australian federal government has ... At the moment - if it wasn't so serious - Australia would be close to the laughing stock of the world. Excellent article Irfan. I have admired you from a distance for a few years. Good that you have moved close to us Melbournians. Australia needed Tony Abbott to realise we don't need him. Time for him to go now. Thank you! I'm descended from 6 first fleeters and many other convicts as well and also the first Australians, so l do consider myself to be a priveledged Aussie to have such history and connection to my country and l find all this decisive behaviour and fear mongering by Abbott and co abhorrent. This is a country of generosity and welcomes, but now there is a meanness of spirit being stirred up by this government and quite frankly we should be better than that by now. People hiding behind religion and behind obnoxious is pernicious and its time all Australian have an opportunity to live here without bullying, prejudice and fear of abuse and discrimination. This is a great country and we should all respect one another and our unique differences. Irfan - quite some years ago while living/teaching in Japan I came across your writing - and was smitten at once! And here, again, you are making perfect sense. I am back in Australia - appalled by the jingoistic and divisive, alienating rhetoric of a PM who doesn't understand the nation he "heads". I won't say "leads" because he doesn't! And his use of the word team reminds me of what Mark DAPIN had to say in his book: fridge magnets are bastards (an A-Z rant about annoying people and useless things in the modern world) 2007 p.214: team player noun, 1. something bastards claim to be in job interviews; 2. the kind of person human resources is looking for to fill a vacancy; 3. a member of sports teams with no particular talent; 4. somebody incapable of doing his job on his own, and therefore forced to rely on subordinates to do it for him. I like mark DAPIN a great deal, too! Keep casting your eyes over our landscape, please! And writing commentary! Well said! Abbott's "Team Australia" is one I will never join. A great piece of writing and straight to the point. There are many Australians who see Abbott as the most divisive PM this nation has known. Just perfect, succinct and brilliant. Thank you for eloquently expressing what so many feel. Good one! Common sense, 1 - Abbott, nil. Its not my team! I grew up in exactly the Catholic environment you describe a with Santamaria, the Knights of the Southern Cross and that generalised sense of difference, exclusion and more dangerously, entitlement. It is a dangerous mix with a false philosophical basis. It is retrogessive and cruel. Two wrongs do not justify a right. I say sorry to you for the thuggery you experienced as a child. A normal Aussie would say, "It makes you the man you are today." Crap! You make you the man you are now, not the beatings and the abuse because you might have been different. I can't wait until the world wakes up and remembers that we are just ONE RACE, the HUMAN RACE. Eloquently stated. I agree with Andrew, more power to you!!! Well said Irfan and yes it's claim to uphold Christian values while treating refugees inhumanely at same time. Enjoyed the article. I am so blessed to live in this beautiful country Australia , I have been here for almost 23 years from Indonesia origin , in my experience during time i never been bullying or insult from my other fellow Aussie, words can not describe how lucky I am to have the opportunity to have better life. I love the life style here where we can express more than where I came from. Wow! It's all been said . Hear hear Dr Vacy. Thanks Irfan. Thank you Irfan for expressing your point of view; thank you HH, Ron Mr Ryan etc for expressing your points of view and thank you ES for publishing them.You are all part of "Team Australia" and if this "Team"is to function tolerance and a modicum of understanding, is necessary. ES is one of the finest examples of what I believe DEMOCRACY to be. As News Ltd and Fairfax become more and more, organs of parochialism, ES retains an independence we as readers should be proud. Well may your prayers for protection save us HH; my hope is that you all respond financially to sustain the present and the future of Eureka Street. Well said Irfan. Succinct and direct. You give a powerful voice to many unheard voices and many undocumented experiences. Good on you. It's quite obvious after reading the comments to Irfan's article that the majority of people operate from a script rather than a God -given conscience - judging from the predicability of comments/postions from regular readers who comment with basically the same position on everything. It would be admirable if their consistency was based on Christian "values", but they are not- they are based on Christian tribalism. These reproaches of ‘Team Christian Australia’ are doing my head in. It seems to work so I’m attempting a pale imitation of you Irfan in mixing argument with sarcasm and wild speculation. Abbott’s quote doesn’t include the word Christian. Irfan effectively puts this word into his mouth. This is apparently of no account. Dislike of Abbott – about anything – is sufficient argument. He has serious form re populist and immoral slogans. But what evidence is there that his Team Australia call was anything more than a good-willed invitation (in his clunky semi-autistic version of edginess) for the Muslim community to publicly share concern at the prospect of Islamist terrorism in Australia, and join together to prevent it? Whether the particular measures he proposed were informed or effective is another question. But some declined the invitation to even talk, and Irfan grandly interprets a dumb slogan as disclosing an ambition for a ‘Christian’ Australia, with ‘yelling and chest beating’. Wow. I now understand you Alice in Wonderland. I’m in a parallel universe. Reality has gone virtual and is disappearing out of sight. Facts and reason don’t matter, forget nuance and paradox. Its about crude emotion – a sweeping speculation is sure to touch the spot in some comfortable worldview. A twitter can start a tsunami. Sit back and count the ‘likes’, take the talk-back. Media is learning that blogged indignation sells better than argument, we are saturated in wallowing opinions. They come and go at break-neck speed – no time to consider misinformation, no need to be accountable or constructive. Well said indeed, David Moloney. For the hegemonic left, it's not about reason. It's about who controls the press, the airwaves and ultimately the levers of power. Consider the many comments above on this supposedly Christian site that barrack for, but offer not the slightest reasoned defense of, Mr Yusuf's patently unhinged propositions - e.g. that we drive on "Christian roads", etc. We're back to the irrational, murderous responses to Pope Benedict's Regensberg address (which proved his point), and to the Moscow show trials of the 1930s. Something evil this way comes. I was born in Australia, in 1988 I was 7 and clearly remember growing up surrounded by prejudice towards Asians - it was ridiculous. Brilliant article thank you for sharing. As a postscript to so-called "reason" - the Australian spokesperson for the Greek political party "Golden Dawn" is hoping to gain access to Australian shores to praise Abbott's genius concept of Team Australia. Nuff said? If Golden Dawn supports Tony Abbott's plan to keep out monsters who are into beheading and crucifying innocents, and wiping the Jewish people from the face of the earth, then as someone who wholeheartedly shares that goal, I believe it reflects rather well on Golden Dawn. Well done Aurelius for unearthing some ‘evidence’. But all it proves is that some fascist has jumped to the same conclusion regarding the intent of Abbott as have the ES correspondents who abhor bigotry and divisiveness. While some plausible things have been said regarding ‘the ring’ (Rashid M) of Abbott’s statements, these are assertions unsupported by the few facts presented in the article. Abbott’s detestable record on other matters is circumstantial evidence at best. I admit however that when he is silly enough to communicate by slogans it leaves the door open to all sorts of interpretation. So yesterday he stated clearly and deliberately, without any reference to ‘Team Australia’, that his target is terrorism, not religion, and that all religions are a part of Australia. By now however the caravan has moved on many no doubt ready to believe that Abbott and mainstream Australia have an anti-Muslim agenda. I don’t believe this speculative ‘Abbott’s Team Christian Australia’ article has contributed to the integrity of public discourse. Perhaps an article on the actual anti-terrorism measures proposed would stay in the boring real world. And provide Muslims the opportunity to contribute constructively to concerns of the wider community regarding potential local terrorism, and critique and educate us about their difficulties and opportunities. Regardless of the original wording and intentions of Abbott's first speech about the "Team Australia", the message that came across is what matters - that doubts were needlessly being cast over certain ethnic groups' team loyalty, and that they somehow had to do something to earn inclusion. And we all know that no matter how much we can rationalise and say it's about terrorism, not religion, it's never going to be that neat and simple. Is the Brigidine nun who's offered to be litigation guardian to the child involved in the Christmas Island class action influenced by her religious values? I would hope so. But they are also universal humanitarian values that people from all religions would aspired to, but that somehow our Christian political leaders seem ignore. I apologize if I'm being overly cynical about why Golden Dawn can relate to Tony Abott's "Team Australia", but I suspect it's not about fighting evil tyranny (I doubt the pep talk was targetted at these tyrants). I suspect it's more about maintaining some sort of control over immigration policy and how multiculturalism should look. At least in Greece they can talk about their ethnic Greek culture and history - but here in Australian - we are intrinsically multicultural, and the only cultural group who can really claim any moral high ground are our indigineous people. response to jericho (31 August 2014): I attended Mass in Mildura last weekend too and got the same Newsletter. My thoughts were as follows: Mr Yusuf tells how, as a child, he found Australia to be “a nation of bullies”. He considers Australia’s history “dominated by the politics of exclusion and marginalisation”. Well, it’s true that Australia is imperfect. We should try to improve it. Yet by world standards, Australia is apparently an attractive place because of its relative freedom from beheadings, civil wars, inter-racial violence, bombing of churches etc. Thousands of would-be migrants, legal and illegal, badly want to leave other places and settle here. Running Australia down is easy (and fairly safe) to do. The Church should encourage criticisms that are constructive, thoughtful and motivated by a charitable spirit. But sensationalism can be counter-productive. Best wishes. Arnold Jago. Personally, I think the experience of the new S.A. Governor, Hieu Van Le, is much more indicative of the values Christianity has brought to Australia than what Mr Yusuf perceives. "WHEN Hieu Van Le’s leaky wooden boat chugged into Darwin Harbour on a misty dawn in 1977, a bloke in a tinny raised a beer and greeted him with “G’day mate — welcome to Australia”. ... As one of the 2059 Vietnamese refugees to come to Australia by boat between 1976 and 1981, Mr Le said his elevation to governor sent a powerful message about the country’s “inclusive and egalitarian society”. ... Premier Jay Weatherill said Mr Le’s life story was a “beacon of hope” and described his appointment as the easiest decision he had ever made. “We are so proud to have him as our governor.” (The Australian, Sep 3). And on the weekend I met a wonderful Pakistani man, Steve Khan,from the Australian Association of Pakistani Christians, who is hoping to create a national "Day of Forgiveness". It's the likes of Hieu Van Le and Steve Khan who truly love this nation with its Christian roots and who are making it even better for us all. If only we were all as grateful and ready to put back in as they are. Words are powerful and Peter Hartcher, in today's SMH, states that by accepting the name "IS" we are giving power to a monstrous terrorist group and equating them with the Islamic religion. We become confused about the Islamic religion and angry that Muslims here in Australia don't stand up publicly against these terrorists who have appropriated their name. Muslims must also be confused about Christianity. We correctly abhor the so-called IS but George W. Bush and his powerful bunch of fundamentalist Christians were responsible for invading Muslim countries and using the latest technological weapons that killed thousands of civilians, including children and left many, many more physically and/or emotionally scared for life. This "coalition of the willing" led by the USA arrogantly assumed they could create an ordered society in their image. How many Christians stood up and publicly denounced what was being done in their name? By following the sort of Christianity professed by George W. Bush we have all been complicit in creating the monster that gives itself the name of IS. Seeing and hearing about the atrocities being committed by these thugs is heart wrenching but powerful weapons let loose from the sky have left many more people just as horribly killed or maimed. Wonderful article - thank you. The PM is definitely not putting"this country, its interests, its values and its people first," he is putting Abbott first - he wants power at all costs and shows he's even willing to destroy the social fabric. Very sad, very true... TA is so USA that should be enough to scare anyone. Thanks. Loved reading the post. I'm a lefty 1/2 Protestant 1/2 Catholic Christian who got bullied for none of those reasons. I'm not sure about some of what you're saying but I found it helpful and would love to sit down with you for a few hours to talk. Thank you, Irfan, for so moving a statement. I'll ride with you. I missed this article last year but must say that the comments are very informative and enlightening. The article itself, however, strikes me as a collection of unsubstantiated, untrue and irrational hyperbole which fortunately has stimulated sufficient corrective commentary. One hopes that Mr Yusuf learns something from the comments , particularly an appreciation of the freedoms he enjoys here, in contrast to the country of his birth and those states steeped in his religion which he has obviously not chosen as his preferred place of domicile.preferred despite their almost universal Islamic religion. Well spoken, hit the nail right on the head. I well remember the time that I arrived in Australia as a student, 1953, greeted by a Bulletin banner that proclaimed this country as White for White Australians. This Anglo-European fear of anything foreign hasn't fundamentally changed. It has been 'watered' down by 'political correctness' but the fear is still there. This fear invades one's psyche in the most infectious manner; by osmosis. Being Australian often means that one carries this fear with all its racial prejudices throughout one's life. We all have a long and winding learning curve to traverse. Why is it that such clear critiques of Abbott's move to make us more jingoistic than we already, are not aired in the mainstream media? Nationalism is just another form tribalism My country is better than yours, my religion is better than yours. It'll be the death of us! Thanks for your article. Very relevant at the moment when we can be carried away with the emotion. Always valuable to look at and know our sevens. Mr Yusuf was bullied as a child. I was a non-English speaking child migrant and was also bullied, but I don't blame it on Christians or anyone except the bullies themselves. I guess I was a target because I was not a sporty type. I moved on, grew up and have left that in the past, where it belongs. I have done well in life and appreciate what Australia has done for me. Australia is home. Such bullying pales into insignificance compared to what happens overseas. Where is the outrage over Boko Haram, which sends 10-year-old girls to blow themselves up and massacres hundreds of people each week, simply because they are not Muslims? I don't support Abbot's jingoism and clearly support pluralism in ethnicity and religion, but if Australia is not to pull itself apart then we all need to have a common understanding of ourselves as a nation, generally agreed laws and values, and to that extent, on the same "team". Contrary to what Mr Irfan states, I don't believe anyone now would suggest migrants should abandon their culture, even if that pressure was there when I was a child. But Mr Yusuf surely cannot seriously believe what he states in his first paragraph: because one cannot ascribe Christianity to food, languages, sports, cars and roads. And in fact whether we like it or not, Australia is a post-Christian society. I agree with Frank S, Australia is most definitely a post-Christian society. In fact, it is thankfully not overly religious at all. And I would harbor a guess the majority like it that way. While in modern Australia many of our customs embody Christian principles it is not really that simple. In many regards those "Christian principles" have evolved to match the views of an increasingly humanist society. I see little distinction between the cultural trappings around, say Easter and the AFL grand final. While I have little regard for our current leader it is a complete furphy to suggest Tony Abbott has ever proposed late settlers should abandon their culture and creed. Certainly those new to the country can face many trials as they build their futures. I do wonder though, for some new arrivals, if one of those trials is being outnumbered by people who reject the idea the followers of any religion have been pronounced blessed, chosen or special by any god. A healthy disrespect for religion does not equate to bigotry. I grew up in the Australian "Catholic" system. I reject Tony Abbott's Team Australia. People such as yourself speak for the Australia I now wish to belong to. As an Irish Australian Catholic I know the history of the repression of my forebears in Ireland . I recall the bigotry we experienced from the 'publics' when I was at a Catholic school in the 50's and 60's.I recognise that Christian minorities in Islamic countries are being persecuted in the name of religion at present .BUT I totally endorse what you wrote Irfan. Irfan thank you for articulating so much of what I have been struggling to say. I lose coherence when angry. As an Australian of English, Irish, Estonian Jewish descent I have no interest in joining 'team australia' if means that others of exotic heritage are denied their place. its now a year old and time has only validated this brilliant opinion piece! You shouldn't swear so much! What would Our Lady of Semi-Iliegal Downloads think? But, prayer solves many puzzles, like the Cryptic Crossword in the New York Thymes.